Long long ago, Capitalism was born as Siamese twin with morality. Adam Smith – the brahma of capitalism – wrote The Theory of Moral Sentiments prior to The Wealth of Nations. It was essential that he had to build the moral foundations first before he could develop the genesis of capitalism. However the twins got separated with the advent of competitiveness. As it happens in real life, the weaker Siamese twin got separated first. Morality- the upholder of virtues and fairness - couldn’t find his voice amidst Machiavelli’s strong reprehensions. He faded into oblivion while capitalism took its vishwa rupa, backed by the collectivist philosophies of Ayn Rand. It took the birth of a frail lawyer called Mahatma Gandhi to revitalize morality from its decay and popularize it too. Mahatma Gandhi, the great strategist, changed the rules of the game in the twentieth century to bring freedom from the British through ahimsa, fully aware that India cannot fight British with force. He understood the mindset of Indians perfectly and infused energy across the weak nation with his powerful spiritual ethos. He unified people amidst diversities and empowered them towards their pursuit for freedom. The spirit of capitalism probably took cue and realized that in twentieth century the race for higher profit margins cannot be won by simply pushing hard for growth. Rules had to change. Sustainability, the new dimension of growth, began to take roots across the world. CSR took birth as corporate sins redemption, with an attempt to salve the conscience of the organization, sickened by the self-destructing race for growth. CSR grew up into corporate social responsibility, firmly establishing the resurgence of morality back to business. No wonder, Gandhi had long declared Commerce (Business) Without Morality as one of the seven sins that should be avoided. Businessmen across the world began to understand that society, as a human being, needed the heart of morality and the legs of capitalism to move. Leadership, the true prime-mover of business, is synonymous with Gandhi. Jim Collins, in his best seller Good to Great, proves empirically how good companies have outperformed the markets and grown far better than any one else. He also talks about how several good companies became great through Level 5 leadership. 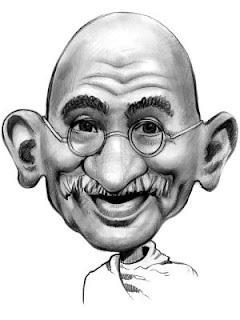 Jim Collins would be amazed to see how all his descriptions of a level 5 leader – self –effacing, quiet, shy, a paradoxical blend of personal humility and professional will- perfectly fitted with Gandhi’s. He was the perfect Level 5 leader who could take a company from good to great. Nowadays, it’s interesting to see trends like philanthrocapitalism being remixed from Gandhi’s old socialist ideas. These trends have begun to bridge the gulf between capitalism and socialism. Gandhi has several lessons to offer. While Human Resources folks can learn lessons about individual empowerment for growth, marketing folks can also learn how he marketed his beliefs to resonate across the breadth of the country even in the absence of technology. Was just about trying to move myself to post a comment, you come up with the next one. You blog at a rate at which cockroaches procreate! This post has got Venkat written all over it.. who else could dwell in this weired terrain where Gandhigiri meets Adam smith and goes on a wild walk through the spirituality of economics narrated in a archaic Indi meets Barron's GRE 2009 language! Thought provoking yet bookish at times. Blog On! I agree. Thank you for sharing your thoughts. I know, I am way too late to respond back. I am sorry.